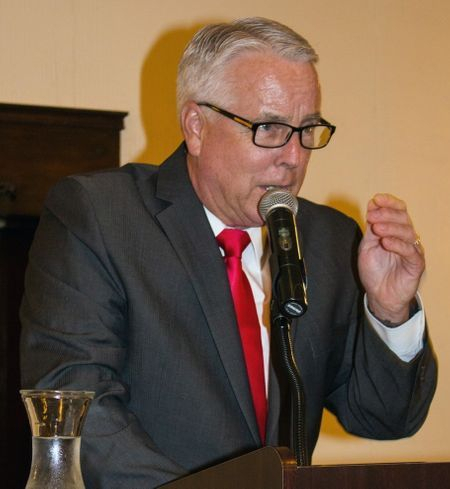 In his State of the City address on Wednesday, Casa Grande Mayor Craig McFarland highlighted some items that will have more of an immediate impact on the community than future new industry and business. He told the audience at The Property Conference Center that City Manager Larry Rains has been meeting with each City Council member to get their views and what residents have been telling them about needs and wishes. Earlier focus areas, he said, were to maintain high quality of life, enhance transportation routes, revitalize and redevelop historic Casa Grande, be a leader in economic development and ensure long term viability of the Casa Grande region. “After meeting with everybody, Larry kind of capsulized the comments,” McFarland continued. “We think that the existing focus areas are broad enough to encompass the goals and objectives for 2018, maybe removing the long term viability of the region since that should be a kind of implied focus and direction of the city and then add a little more emphasis to the quality of life focus. “And what I found interesting when I went through Larry’s notes is the commonality between all of us in the the belief and needs for the city. I’m not going to list all of them, but I do have short list. “They were to develop a transit plan, build the community center, develop a parking plan for downtown, stay focused on workforce development, create initiatives to address the homeless issue, like the health community initiative, and create entrepreneurships and programs for the community for industry, interacting with community and industry, assess our boards and commissions, create a volunteerism program, community pride outreach campaign, develop a marketing plan, develop a city customer service initiative, cover the rodeo grounds and plan to address the public safety retirement shortfall. McFarland touched on another community need area. “There’s a community health initiative that I’ve asked Lisa (Fitzgibbons) and Donna (McBride) to take on for the council,” he said. “We’re going to try and work with all the local service groups to try and bring everybody together. The city can’t do it all by ourselves, we need that community involvement. “So we’re working on that initiative to try and bring all of those together to deal with the homeless problem, talk about the homeless problem, talk about mental health issues that we have in the community and bring everybody together, all the service organizations, all the ministries, so that we can all work together on this problem. “We’ve got our transit study under way, so we’re going to be continuing on that, I think we’re about halfway through that,” McFarland said. “We’ve got a new city website coming out by June 1. It should have a lot of exciting stuff and interaction. You’ll actually probably find the maps to CG Mountain. Rains said the center would be under design by summer. McFarland also mentioned Voices, a local project by Chuck Wright, highlighted in a new magazine. “We’ve got a lot of things that are going on,” McFarland continued, “such as Grande Sports World with the pro soccer and lacrosse and the cross country events that happen out there. McFarland’s presentation included a silent two-minute video highlighting Casa Grande. The city, in cooperation with the local chamber of commerce, is also working on destination marketing. “I know that the city doesn’t control or manage the education here in town,” McFarland said, “but we do have an opportunity to talk about what’s positive about our schools. “When I first got here, there were two things being said: the hospital’s terrible and the schools are terrible. Well, that is not true today. Our hospital is wonderful, it has changed a lot. And the schools are good. “I’ve been to probably six of the schools here in town in the last three months. They have a program of The Seven Habits of Highly Successful People. I went to an event at Ironwood where first and second graders and kindergarten were talking about Seven Habits of Successful People and it was amazing. Who talks like that? First graders. I was very impressed and if you haven’t seen any of it, you really should. Cactus Middle School with the Seven Mind Sets program that they have, and all middle schools incorporate the Seven Mind Sets and if you haven’t seen any of that, you really need to. “Our schools are in great shape, I think, personally, from my observation. “Also, we need to talk about our A+ schools. We’ve had a lot of A-plus schools here in Casa Grande — and they’re public schools. Villago just went through their rating (to be notified in April). So A+ schools like Villago. Ironwood had it three years in a row. The accreditation at Vista Grande they’re going through right now. Education ties in with workforce development, McFarland said. We’ve talked about this, as well,” he said. “This whole partnership is actually being led by CAC and has done a wonderful job building curriculums for our local industry, looking at any trades, might be plumbing, electrical, warehousing and technicians, maintenance, you name it. The high school district is also involved. “We continue to push the state on I-10 widening,” McFarland said, noting projections of jobs, population and visitors centered in Casa Grande. “If I-10 doesn’t get widened, it’s going to be a parking lot if all those things come to fruition, so we really need to all be talking to anybody who will listen about widening I-10. And believe me, I’ve been a thorn in their side. “The Kortsen Road interchange at I-10 and the sewer line extension to serve the east side are moving forward. The I-10 interchange at Kortsen will probably be a private-public partnership, so therefore it will actually be done. “The Dreamport Village and Henness Road interchange and the Selma interchange will probably be moved up on the (Arizona Department of Transportation) timetable. “There’s lots of work ahead,” McFarland said in closing. “As I’ve said many times, these are exciting times, but working together I know we can make this happen. During his 2016 State of the City address, Mayor Bob Jackson, right, touched on several subjects, including what city officials need to be watching in the future. There are several issues that future mayors and City Council members need to be considering and acting upon, Mayor Bob Jackson said during his final mayoral State of the City address. They range from keeping up with infrastructure to accommodating the millennial workforce. Because the city went ahead and expanded and modernized the sewage treatment plant, Casa Grande was able to handle new industry. On-line shopping will continue to be a problem for traditional brick-and-mortar merchants in the city, the mayor believes. “I on-line shop, just like probably everybody here does,” he said. “But the fact of the matter is, on-line shopping does not pay a local sales tax. “I’ve talked to some of the small merchants here in town. They’ll get somebody to come and look at an expensive piece of equipment, oh, yeah, I can test it, feel it, I like it, then they’ll go buy it on-line so they avoid the sales tax. “That same business owner is the guy who gets the call when Little League needs a sponsor or the Cezar Chavez dinner needs a sponsor for scholarships. Part of economic development is workforce development, “always a problem,” he continued. When economic developers come to the city, Jackson said, Casa Grande gets criticized for its workforce. City officials are already seeing how millennials view work, Jackson said. “I think moving forward, one of the things that we are all going to have to look at is the millennial workforce,” he continued. “I know we’ve had this discussion many times in City Hall. “I’m a baby boomer, I’m sure they thought the same thing about me when I was 20-something years old, what we’re going to do about the baby boomers. “We recently implemented a paid time off plan instead of the traditional sick leave/vacation leave. Very strongly supported by millennials, not such much the baby boomers. But it’s one of those transitions that we all need to make. “I think going forward, the city of Casa Grande needs to get ahead of that, because if we don’t, we’ll have an aging workforce and we’ll find ourselves in a situation where we don’t have people to fill those jobs. “We need to continue developing the trail system up on CG Mountain. There’s thousands of acres up there, we need to make sure that we build it out to the best of our ability. As the city considers all of the above issues, Jackson said, “We really can’t lose site of the quality of life issues that Casa Grande has. “Typically what happens in government is the thing that’s screaming the loudest getting attention, the quality of life things are the last on the list. “As we go out and prospect for economic development newcomers into the area, quality of life issues are one of the top things they look at, so we can’t really ignore that as we move forward. But the pressure’s going to be there to spend that money someplace else. “I’ve said this many times, Casa Grande is a great place to live. We need to maintain that sense of community here, and I think one way you do that is to be able to live, work and play in the same spot. “I did my time commuting to another city. It was always really hard to decide whether I’m going to spend my leisure hours where I lived or where I worked. The Arizona Legislature, not known for friendship toward cities, often passes legislation that directly affects municipalities — usually for the worse. Mayor Bob Jackson touched on some of those actions Wednesday during his State of the City 2016 address. “We find ourselves in a situation frequently with the state Legislature doing things that affect our ability to do the services that we provide to the public,” Jackson said. The money comes from several sources, but mostly from the state tax on gasoline. The revenue is allocated to cities and counties based on population. The fund is supposed to be for road improvements and maintenance. “Over the last five or six years the state has taken money out of that HURF funding to pay for the Department of Public Safety,” Jackson said. “And it’s affected us in Casa Grande about a million dollars a year. In a sense, Casa Grande is lucky because a majority of its streets are in good shape. “We recently completed a study which is out for public hearing right now through the Sun Corridor Metropolitan Planning Organization,” Jackson said. 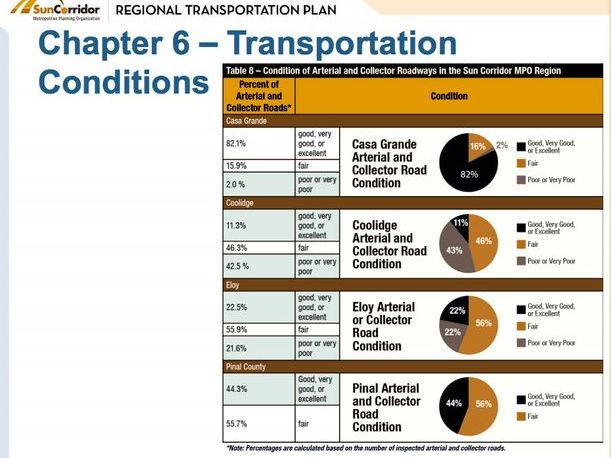 “They did a pavement rating system for Casa Grande, Coolidge and Eloy. The categories were poor, very poor, good, very good and excellent. 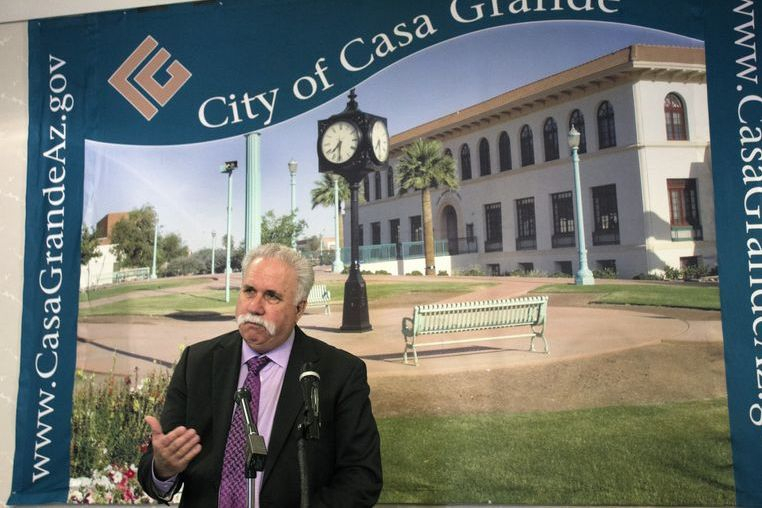 “In Casa Grande, 82 percent of the streets were rated as excellent, very good or good. Good roads help with economic development, Jackson said. “You drive into a town, if the roads look good you think, well, the town looks pretty well run. Jackson said the Legislature is considering a law allowing guns to be brought into public buildings. “I know my wife, Judy, worries about this all time,” he continued, “and if you’ve been in City Hall we have like zero security in there. “What the law says is that you can bring guns into public places, as in City Hall, unless the government entity wants to put in a security system. The guns proposal would also apply to other city buildings, such as Parks and Recreation and the two libraries. “We probably own 35 or 40 buildings,” Jackson said, “and if we’re gonna put in a security system and a security guard, probably cost the city of Casa Grande a couple million dollars. “The alternative is to let people come in with guns. The Legislature also has a bill that would eliminate sales taxes on rentals. “That is not a big hit for Casa Grande, but it is a hit for some of the other cities,” Jackson said. “We get about $200,000 a year. “If you’re in a city that has a higher percentage of renters, like Phoenix, that’s a huge financial hit. PhoenixMart, the proposed international trade facility for the east side of Casa Grande, has seen continual delays, sparking various versions of what is happening. Mayor Bob Jackson touched briefly on the situation during his State of the City address on Wednesday. “I really debated how to address this one, because there’s so much misinformation out there,” Jackson told the audience at The Property Conference Center. He said that during conversations with PhoenixMart officials, “they did provide me some guidance at to what they would like me to say about it. What he knows includes issuing a permit for initial ground work at the site. “The footings and gradings is essentially done,” Jackson said. “I think 850 footings out there. “We have issued them a foundation permit to do the slab and the utilities under the slab. Jackson said Planning and Development Director Paul Tice told him on Tuesday that PhoenixMart has again submitted a final plan for the building. “I think it’s our third or fourth review on that,” Jackson continued. “By the end of this week we should be prepared for them to come in and pick that up. Jackson said city officials will be meeting with PhoenixMart the week after next. Jackson added that, “it’s a very challenging project. It has no infrastructure, it’s a big project. It’s one that there’s only two of in the world. Any number of issues that just made it take longer than any of us wanted. Casa Grande Performance Institute, that large complex with athletic fields just east of Francisco Grande resort, has been the subject of some controversy in recent months, mostly about lagging payments to the city. 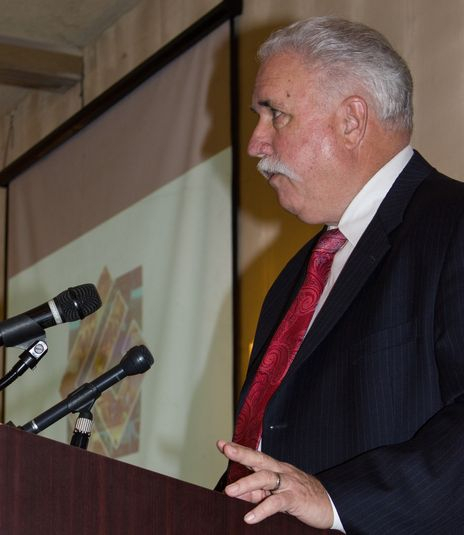 “I know there’s been a lot of stuff recently written about it,” Mayor Bob Jackson said Wednesday during his annual State of the City address. What needs to be considered is the reality at the time the complex was built,” Jackson continued. “We at the time were looking for youth fields and we were looking at different pieces of property that the city of Casa Grande owns. We have a robust youth soccer/football program in town and we’ve run out of field space for them. “Francisco Grande came to us and they said, look, we have an idea of a public/private partnership where if you help us build this facility we will maintain that facility. “So as we sit here today, we have eight soccer/football fields for youth programs out there that are the best in the state of Arizona. And if you talk to people who have kids that play soccer and have been here to play, they will tell you that these are the best fields they’ve ever played on. The complex, also referred to as Grande Sports World, has brought other benefits to the city, Jackson said. Because Arizona is not a soccer state, “we don’t see much of that,” he said, “but when the Seattle Sounders come down here to practice, our winter visitors from Seattle get on the internet to find out what the practice schedule is in the Seattle newspaper so they could go out and watch them. “Has it performed the way we really wanted it to?” Jackson asked. “But I don’t think that it’s the white elephant that so many people have made it out to be. “Again, we’ve run youth programs out there that we don’t pay a dime for the maintenance. So in my mind, we were going to build the fields anyway, we just built them out there, somebody else is maintaining them at a savings to the city of somewhere between $500,00 to $600,000 a year. There has been much talk about the United Football League that was in town when the complex was begun. “I do think that things are getting better out there,” Jackson continued. “I do know that you’re going to see some announcements hopefully in the next few weeks that will, again, bring light to the fact that that is a great facility, it’s brought a lot of attention to the city of Casa Grande that we would not otherwise have gotten. “It’s really helped in our economic development, not to mention the increase we’ve seen in our room tax revenue. successes and pointing out areas of concern. The presentation by Mayor Bob Jackson was preceded by a video featuring comments from residents, a review of some city activities and improvements, private-sector projects and views from City Council members. Watching the video helps understand parts of Jackson's address, given that he referred to it several times during his presentation. The city said the address will be broadcast on Cox Channel 11 on Monday, Wednesday, Friday and Sunday at 8:30 a.m. and 6 p.m. It will also air on Tuesday, Thursday and Saturday at 8 p.m.
A wide range of topics was covered March 19 during Mayor Bob Jackson's State of the City address, held this year at the Holiday Inn. The following report consolidates his statements by topic of interest. "I know I stood here last year and said we're going to start it, and I was wrong," Jackson told the audience of more than 150 people. The city had been looking for a nonprofit partnership, he continued, "because the model at that time was that if you could do a nonprofit partner you could afford to do it less expensively than having the city operate it totally. "We had negotiated a contract with the Valley of the Sun YMCA. We were ready to take it to the City Council and got a call from the executive director and they said, you know, we think we've overextended ourselves so we're going to have to withdraw our contract offer. "So we went back to the drawing board, had our staff start working on financial arrangements, because our worst nightmare would be to build this facility and then not be able to operate it. "Staff has done a great job. They've come back with a plan that appears it would cost no more to run that community center than we currently provide for all of our recreation programs and the space that we've got spread all over town," Jackson said. "We already have a contractor and an architect on board with that project. It is funded through some bond proceeds that were approved by the voters about seven or eight years ago (November 2006). The community center presentation made to the City Council during its annual retreat in February is HERE. "I'd be absolutely remiss if I didn't talk a little bit about Phoenix Mart," Jackson said. "That still remains probably the number one question I get from people, is what's going on with PhoenixMart?" "As of this morning, we have issued a foundation permit for them and so we would expect to see them start working on the foundation in the next few weeks. "We've also been working with them on what's called a fire code analysis. They turned that in about a week and a half ago. We will have reviewed that and returned it to them by the end of the month. And once they get that back and we're all in agreement with what it says you'll start seeing the building go vertical." The city is also about to start building a major sewer line to serve the PhoenixMart project. The city is paying a share to be able to upsize the line to serve future development in the area. "It's about six miles of sewer line," Jackson said. "It will go under I-10, more or less down Kortsen Road, Hacienda and Cottonwood and will serve the PhoenixMart project. "Design is currently underway on that. It's a share cost. The city will be doing the project, PhoenixMart's paying for half, the city's paying for the other half. "We have most of the right of way. While we haven't gotten signatures on paper yet for this right of way we've negotiated the right of way with virtually all the people we need to. Design is almost done, so we expect to start that project probably in the next 60 or 90 days. We also have a contractor on board for the project, as well." Jackson continued that, "for our guests who maybe don't know what PhoenixMart is, it's a 1.7-million-square-foot sourcing center. It will about 1,700 vendors inside of it and it's really a manufacturer-to-end user market, so it's not a typical mall. "It's taken some time because they've had issues with some of the foreign direct-investment that's involved with the project, but I think we feel today better than we've felt in a long time that the project's on the right course, they're making progress. The fact that we've issued the foundation permit means that we're moving forward on that project." This month, the Planning and Zoning Commission forwarded a favorable recommendation to the City Council to amend, for the fourth time, the PhoenixMart planned area development, cleaning up the previous changes. You'll find the presentation HERE and the staff report HERE. "Thornton Road is going to be reconstructed," Jackson said. "If you've been out there, the road's falling apart and it does play a huge role in a lot of the freight movement that runs north and south through town. So we'll be reconstructing the road from Gila Bend Highway to Cottonwood Lane." "We've got some signals coming into town," Jackson said. "We've got one at Camino Mercado and Florence Boulevard and for those of you that maybe go to Cottonwood Clinic or the CAC Small Business Development Center, trying to get out of there is almost impossible. There's a gas station going in across the street, there will be a signal to be built there, the gas station can't open 'till the signal's in. "It's a Valero gas station They tried to get into the market here about five years ago and when the economy turned south they decided that they would hold on to their holdings for awhile. As you can see, they're up out of the ground and look like they're probably 60 days away or so from being ready to open. "We're hoping to have that signal up and operational by the middle of summer. It will make getting in and out of that center much, much easier. I know I go over there to a lot of Access Arizona meetings and I generally turn right coming out of there because it's so difficult to turn left. "We also have one going in at Casa Grande Avenue and McCartney Road, which is the exit out of Villago Middle School. And if you've ever had occasion to be there about 3 o'clock in the afternoon, again, you can't get out if making a left turn because of all the traffic on McCartney Road between the freeway and Fry's Marketplace and the kids coming out of school. "We hope to have that signal operational by the time school starts in August." "We also finished a design concept report for the Kortsen/I-10 interchange," Jackson continued. "A lot of people ask, why are you going to Kortsen Road instead of Cottonwood Lane? The Federal Highway Administration's guideline is interchanges every two miles, so in our case, we'll have one at Florence Boulevard, one at Kortsen Road, one at McCartney Road, one at Val Vista. "Because of the development pressures that are occurring around that Kortsen interchange, we felt we probably needed to start working on a design that we can then work with the Arizona Department of Transportation to fund an interchange at that location." A video of the interchange open house is HERE. "We also have put solar panels out in many of our city facilities," Jackson said. "It looks like covered parking, but they really serve an interesting niche. "We were the only city to do it the way we did it, as a private sector model, and we are already seeing savings above and beyond what we expected to see with the solar panels. We did add some this year to the Public Safety Building and Fire Station 504. If it looks like that makes sense, we will continue to do that. "And what it does is it locks in our electric rate for the next 20 to 25 years. It's a great, great program and the added benefit for us is that we get covered parking in the summertime." Among other city project were renovation of the public safety dispatch center and the downtown library, both part of the video preceding Jackson's address. "The biggest one is the distribution center for Tractor Supply Co.," Jackson said. "They're building out by the Wal-Mart Distribution Center, it's about 600,000 square feet of space. I was out there three weeks ago, maybe, the walls are up. They expect to start hiring probably within the next two months and hope to have training in the facility in the early fall and being shipping out by the end of the fall season of 2015. "Really nice catch on our part. They will employ about 270 people when they get up and running. They do pay benefits. They're a company that's been around since 1938. They're a Fortune 500 company. All of those things are just really good things when you look at economic development prospects. So I'm looking forward to having them be part of our community." "They're also building a retail store here in town," Jackson continued. "They're building a facility just west of the LA Fitness center on Florence Boulevard. If memory serves me correctly, it's about a 25,000 square foot store. "They're in a hurry, so we expect to see them starting in the next few months. "Tractor Supply is one of the fastest growing retailers in the United States. The distribution center that they are building here will serve Arizona, New Mexico, southern Utah, southern Nevada and a little chunk of California. "You're starting to see more and more of their stores pop up. There's one in Tucson, there's one in Coolidge, one up in Buckeye, one in Show Low. Again, all of those stores will be serviced out of our distribution center here in Casa Grande." "We do have another new industry that is starting to renovate the facility in the old Hunter-Douglas building (on the Gila Bend Highway)," Jackson said. It's called Food for Life and they are a commercial bakery, they're out of California. They are renovating the Hunter-Douglas portion of the site as we speak. They do have plans to expand it. They've bought the corner of Gila Bend Highway and Thornton Road and will be putting a new building in there. I think they hope to be in operation some time this year. "I don't know their employment numbers, but I'm guessing they're probably 40 to 50 employees." "They've come in with a plan for an assisted living facility," the mayor said. "We do have plans in place, being reviewed right in our Building section for that project to start, so we would expect to see it come up out of the ground hopefully in the next 90 days or so." "There is a project called the Wellspring Therapy Center which has been languishing around for some time," Jackson continued, "but I understand it looks like they're finally going to come out of the ground. It's a physical therapy facility to be located on the southwest corner of McMurray Boulevard and Henness Road across from the Palm Creek RV Resort. "Looking at that extended care kind of facility, certainly proximity to the hospital will be a great addition to the community. We hope to see them start construction yet this summer." "I will confess that as I stood here a year ago I was pretty worried about the mall, because I think there were lots of people that were moving out and we didn't see people moving in," Jackson said. "I'm really happy to say that in the last few months we've seen several new tenants come in there, Krispy Kreme Doughnuts being one, Beall's department store is out there now, they just opened a Party and Cake Depot." In addition to a McDonald's, Jackson said, "Buffalo Wild Wings was just approved. They'll be going in between In-N-Out Burger and Krispy Kreme Doughnuts. Nice addition to town. They're telling us they want to get going in a hurry, so I think now that they're approved we should see them start construction fairly quickly. "We do have several other people that are looking at the mall and so it's encouraging to know that we're going to reverse that trend of having people move out and start having them back in." A Circle K will be built near McCartney Road and I-10. It was also announced earlier that Circle K has purchased the former Chevron station on North Pinal Avenue at Rodeo Road and is converting it to a Circle K, then closing the present store to the south. A Taco Bell is coming to the Fry's center on North Pinal Avenue. Raising Cane's chicken is being built between Culver's and Walgreen across Florence Boulevard from the mall. "During 2014 we saw the opening of Ehrmann Dairy," Jackson told the audience. "You saw in the video that they make Greek yogurt. "That was a great find for a couple of reasons. Certainly, they're a good employer. It's their first plant on the West Coast, west of the Mississippi. It helps our local dairies because much of the raw product they get comes from the local dairies. And Greek yogurt is a rapidly growing consumer element that 10 years ago people hadn't heard of. "They are up and running." Earlier in his presentation, Jackson had talked about expansion of the city's sewage treatment plant and the associated costs (see Sewer/trash bills section, below). "I talked about how important infrastructure was," he said. "They are a large sewer user and had we not spent the money to build a sewer interceptor within a half mile of their plant and expanded our treatment plant we would not have landed Ehrmann Dairy. "We were competing with a couple of other Arizona cities for that project and because we had all the infrastructure there ready for them to go they ended up coming into Casa Grande. "They have about 150 employees. They do have expansion room at the plant and I understand that they are talking about some plant expansions, as well." "Just the east of Ehrmann is Franklin Foods, they make cream cheese," Jackson continued. "Again, a company that if we had not had the infrastructure in place we would not have been able to land them. "They also use local milk products for their manufacturing operation. They employ, I think, about 40, 45 people. "But again, a nice, steady growing industry that we've been able to provide a home for here in Casa Grande." "We did have an expansion out at ACO Polymer," the mayor said. "It's a company that is out at the airport industrial park. We are the North American headquarters for ACO Polymer, a company that's based out of Germany They expanded and added about 40 employees out there during 2014." "I tried to do my own little estimate of how many jobs that entailed over the last 12 months," Jackson said. "It's somewhere around a thousand jobs in our local economy that have been created with the Ehrmann Dairy, the Tractor Supply, the expansions at AACO Polymer and Hexcel, Sam's Club. "And to put that in perspective, our work force is about 20,000 people, probably, maybe 22,000. So if we've created a thousand jobs in our local economy, that represents five percent of our work force. Now, I recognize that there's a component of companies that have closed, so it's not a net 1,000, but if we can generate a thousand jobs a year for the next four or five years we'll be in really good shape as a community. "And I think our City Council, city staff are absolutely committed to doing that." "Planet Fitness just came in," Jackson continued. "Those you who have been here a long time will remember when that used to be a Wal-Mart store. Now it's a Goodwill store and there's a Room Store in there and the newest tenant is Planet Fitness. It's kind of a different fitness company that really is structured for nonmembers, so you can go in and pay for three months and stop if you want to or if you like it you can continue to pay. Very nice facility if you've not been in there." "We also have a brand new restaurant downtown," Jackson said. "It's called Red Estilo Mex. They went into the old Picazzo's building at Florence Street and Florence Boulevard. It's different but it's very, very good and I certainly would encourage all of you to try the new downtown restaurant." "We had 118 housing starts last year," the mayor said. "While that number pales in comparison to the 2,500 we had during the upsurge of the economy, it's about three times what we were averaging in 2010, 2011, 2012. "We are seeing that trend increasing, we are seeing homebuilders that are coming back into the market, we are seeing a lot of interest in some of the existing lot inventory that was built but never had homes built on them. "I think over the next few years you're going to see more and more homebuilding taking place. "With that being said, I will also say what I said last year, and I believe this to be the case. Again, I don't want to put words in the council's mouth but I think they agree with this comment: our goal has always been to grow the local economy by bringing jobs in here. If we bring enough jobs in here, that will drive the housing industry, because I think what separates Casa Grande from a lot of other communities is that so many people live and work here. And it's really hard to commute -- and I spent 10 years of my life commuting 30 miles to work. It's really hard to take ownership in a community you live in if you don't work there. And conversely, it's hard to take ownership in a community where you work if you don't live there. "And so, we've always tried to stress create the jobs, have the jobs drive the housing, have the people move here so that they live and work in the same community and then they take ownership in the community, as well. "And I think that certainly as we move forward that will become more and more true." Comprehensive annual financial report is HERE. Popular annual financial report is HERE. "We did increase our fund balance this fiscal year by a little over $22 million. We have always tried to maintain a fund balance of $20 million. To put that in perspective, our General Fund budget is about $35 million, so we have a pretty healthy rainy day fund, if you will. "And we do that partly so we can maintain our bond rating. As you saw in the video, we have an AA bond rating. It's been raised four times in the last five years, and given the economic condition that's almost unheard of. "We did privatize the golf course. I know when I first came into office, eight years ago, the golf course was operating at about a half a million dollar a year deficit. Today I'm happy to say it looks like we might even turn a profit. "If you play out there, the course is in some of the best shape it's ever been. I think we've managed to privatize it without really having the public notice what was going on. "It's a great asset to have in the community, I'm glad we've got a place to get rid of our effluent from the treatment plant. And I think moving forward that privatization of the golf course was a really smart thing to do." "If you own your own business, I'm sure you've seen the cost of medical coverage for your employees going up. "I will say that thanks to the hard work of Dawn Jett, our human resources director, we've seen two years in a row of declines in our medical insurance premiums, which is really unusual and a real tribute to her to go fight the battle with the insurance carrier that brings the cost down." "We try to be competitive with our salaries. And in Casa Grande, we are a little bit different than a lot of the other rural communities because our competition is the Valley, so we have to have competitive salaries. We are currently doing a salary study to make sure we maintain that competitiveness. But my sense is -- and we've not seen any of the numbers yet -- that we are going to have to do some salary adjustments to stay competitive in that work force. "And if the economy improves, I think more and more people are more and more willing to leave jobs for new jobs, so I feel that moving forward we need to make sure we're competitive with our salaries." "We have some areas of concern moving forward, however, that we need to be very diligent about:"
"We are very reliant on sales tax. We had fairly flat sales tax revenue for the last seven or eight years. We are starting to see a general trend upward on retail sales tax. "Sales tax has multiple components to it, and if you put all the components together we've seen about about a half a percent increase in the total sales tax year over year between 2013 and 2014. "We are seeing an upward trend in that, and I think that's because I do believe the economy is getting better. "Among the things I think we look at that are challenging moving forward, a little about sales tax, why we aren't seeing sales tax revenues trending upward. "I can't speak loud enough to everybody that buy local is so important, because that local sales tax stays in the local area. "We opened up a Sam's Club this past year, certainly that has helped capture some of that leakage that was occurring in Casa Grande for sales tax, but sales tax is the number one revenue source for the city of Casa Grande and funds predominately public safety, both police and fire. So buy local and buys lots. "I will tell you that the trending over the last couple months appears that it is recovering fairly nicely. We hope the trend continues and I do think that that's indicative of what's going on in the local economy." "The second area that I think we have some challenges with is the assessed valuation of the community. During the downturn I'm all of you that own homes here in town saw their property tax bill continue to drop, because the assessed value on their house had gone down. "It appears that for the upcoming fiscal year which starts on July 1 that that downward trend in assessed valuation has stopped. We're expecting it to start going the other way. Since we're not going to assess any more than 99 cents, and I know I'm kind of tying the council's hand by saying that but I also am pretty comfortable that they agree with me. "We're only going to see a growth in that if the assessed valuation grows. "We have had some new development in town which certainly will help that, but we need to have the general assessed valuation in the entire community go up." "Certainly over the last five or six years we've had very little operational growth within the city family, if you will. "And I think the pressure being applied to increase services, enhance services, to add services is always going to be there. "We're not out of the woods yet, so I don't know that the next fiscal year growth is going to be any different than the past has been. "But I do think the pressure's increasing." "One of the things that has happened that is really beyond our control, many of you read the newspaper about public retirement systems, the public safety retirement system for police and fire, is hit on some hard times. "That cost to the city of Casa Grande in the upcoming year is estimated to be a little a million dollars more than it was last year. So a significant hit. "We have no choice, we do have to pay it. "The police and fire pensions issue is not going to go away. We expect over the next four or five years for that trend to increase. "It's done, really, on a employer by employer basis. We have a lot of long-tenured police officers and firefighters in the city of Casa Grande and so as they approach retirement age that balance is going to get worse and worse. "So I think moving forward our expectation is that our cost for those pension programs is going to continue to go up." "We're hamstrung a little bit by state and federal legislation that happens. "Of those that have really impacted the city of Casa Grande, one is this thing called the Highway User Revenue Fund (HURF), and the state Legislature for the last few years has been transferring money out of that fund to help balance their general fund. "What HURF revenue is is road tax revenue, what you pay at the gas pump, what you pay for your vehicle license fees. "The road system throughout the state is falling apart, but they still transfer around $90 million a year from HURF revenue to help pay for the Department of Public Safety. "In Casa Grande, I will tell you that our population increased 100 percent between 2000 and 2010 and our HURF revenue is almost identical to what we had back in 1997, '98, '99." "There's some bills in the state Legislature that are going to impact how we do our job. Moving forward, while we may have great plans and things we want to do next fiscal year we may find that we're unable to. Just the way of the world today. Certainly one of the big ones is a rental tax repeal bill that's being wound through the state Legislature right now. Certainly, we don't get hit as hard as some other cities do, but it's about a $200,000 a year hit if they remove that tax." "We started a program under the previous City Council -- and frankly I think it was a brilliant idea -- where we have a policy where we take one-time revenues and use those for one-time expenses. "Predominately it's construction sales tax You don't know if that number's going to be up or down, so we started funding an equipment replacement program with that. "So when we buy a piece of equipment, the day it's delivered we start putting into a fund to replace it. We just bought a million and a half dollar fire truck, we were able to pay cash for it because of this equipment replacement fund. "Unfortunately, what's happened over the last 10 years is that we've underestimated the inflationary cost of a lot of those large pieces of equipment, so our equipment replacement fund has been underfunded a little bit and I think that will be one of the things we'll work on, because it's really nice to not have to finance police vehicles or fire trucks or street sweepers, whatever it may be. And I also think long term it really helps our financial stability. "We've had several instances where we were supposed to replace a piece of equipment, we've looked at the maintenance history, we've decided we can keep it an extra year. If you're talking about a million-dollar scraper out at the landfill, that extra year of service you get out of it is a significant amount of money and a significant savings." "One of the other areas that I think that we're still challenged with is the wastewater and sanitation revenue. "And certainly one of the calls that I regularly get from people is, why do our fees continue to go up? "There's a couple of reasons for that. "I talked earlier about state and federal issues that sometimes creep in and you don't any ability to say no, really, so you've got to adapt. "In the case of the sanitation fund, we own and operate our own landfill. Ten years ago, we were able to show the state we had the financial ability to close the landfill when the time came and take care of it for 30 years after it closed, which is what the federal requirement is. "They changed the rule and we now have to fund a replacement for the landfill, so a big chunk of your sewer and trash bill that you pay goes toward that closure, post closure care and the replacement of the landfill. "The trash issue is kind of interesting, because it's all predicated on the the life expectancy of the landfill. "Twenty years ago we thought we had 20 years of life. I think if you talk to the Public Works people today they'll tell you we still have 17 years of life, so I'm not exactly sure what happened. "It's a moving number, but at some point we're going to have to replace the landfill, we're going to have to close the existing one, and if that happens sooner than we expect we're going to have to adjust those sewer and trash fees upward to cover that. "On the wastewater side, we just expanded the wastewater treatment plant, doubled the capacity, about two years ago and we predicated a lot of that on projected growth that was going to happen. "That project started probably in 2006-07 at a time when we were booming, so we set up a financing mechanism that anticipated that the growth would continue and we would use some of that revenue to help pay for the sewer plant expansion. "As all of you know, the housing market has fallen apart. Certainly, the amount of money we get in on capacity charges for new development has gone down, so we've had to substitute a portion of our sewer bill to help cover the cost to pay for the bonds that paid for the treatment plant expansion. "Hopefully you all understand -- I know I speak for all of the council -- that we agonize over the sewer and trash bill every year and if there was a way that we could do this without having to increase it we certainly would, but it's just a fact of life and we need to make sure that we have the facilities ready to go when we do get new growth started. "I've always felt that Casa Grande, even though our sewer and trash fees continue to rise, that we get a really good value for the dollar that we ask the taxpayers to pay." "I looked at sewer and trash fees. And while we were the lowest rate in our neighboring cities, the sewer/trash bill was, I thought, a little more fair, I guess. "On July 1 (the start of the fiscal year) Casa Grande's sewer/trash combined bill was $48.70. The low was Coolidge at $41.22 and the high was Maricopa at almost $88." "So you can see that we're in the middle of the pack in terms of what our sewer and trash bill is. "While I say we don't really want to raise those fees at all, we feel pretty good that we're still in the lower third of the neighboring cities for sewer and trash." "We continue to be working regionally, as well. We are members of the Greater Phoenix Economic Council as well as Access Arizona. "Certainly, those two affiliations have really helped us attract more and more new industries. We are currently working with two or three, one that we know we're in the final three for. Could be a huge addition to the community. "And we will continue to be aggressive in that economic development front. "When PhoenixMart gets up and running, I think that the industrial components for this community will be looking up into the Valley for employees to come down here because we're going to have more jobs than we have people to fill them." "We also are a member of what's called Sun Corridor Metropolitan Planning Organization. It's fairly new. It's Eloy, Coolidge, Casa Grande and the unincorporated area of Pinal County around those three cities." "It's a way we funnel federal transportation dollars into our community. Because we are now a MPO we will also be looking at becoming an entitlement city for community development block grants. "So again, we're bring some additional revenue into the city that we didn't have before." "I also sit on a Interstate11 coalition group. If you've not heard about I-11, it is a proposed new interstate highway that will connect eventually Canada with Mexico. "The piece from Las Vegas to Phoenix has gotten a lot of press. We've worked very hard in Pinal County to make sure that we work on the piece from Phoenix south to at least Tucson, if not the Mexican border, because we believe that that will open up trade opportunities. "If you look at Casa Grande, the way we sit we've got great east-west connectivity, we've got a railroad. We don't have very good north-south connectivity, and I-11 will provide that. "So we will continue to push that envelope, certainly working with Mayor (Christian) Price from Maricopa, Supervisor (Anthony Smith) Smith from Pinal County and we're trying to expand that membership, but I think we've got people's attention because I know Mayor Price has been back to Washington D.C. and the congressional delegates see us coming and now they're, oh, God, here comes these I-11 guys again. "And I think it's important. We need to push that project forward. It probably won't happen in my lifetime, but I think if we can leave the legacy that we started it, that's as good as we're going to get. "I-11 has just recently approved for an environmental first phase process. We will be active in that to make sure that I-11 comes through Casa Grande where we would like it to come through as opposed to where everybody else thinks it should come through." "There's also a group called JPAC, the Joint Planning Advisory Committee, that's made up of Maricopa Association of Governments, Pima Association of Governments, Central Arizona Association of Governments, and the Sun Corridor MPO. competition for economic development is no longer Las Vegas or Salt Lake City, Utah, but instead is the northeast corridor for the Los Angeles metro area or Shanghai. How do we enter into that as a regional group as opposed to individual groups? And I think that moving forward, certainly I've been involved with this since they started, the fact that our new MPO is now at the table with them I see nothing but good things out of that over the next few years." "I continue to kind of pound on the state and federal people about widening I-10 through the Indian community. "I absolutely appreciate the difficulty of that project, but I would wager that everybody in this room has driven on I-10 through the Gila River Indian Community and been stopped or been slowed down to 30 miles an hour. "The traffic on that stretch of road has become almost unbearable and I think if we don't go out there and start asking the questions about why can't we widen I-10 it will never happen. "So we're going to continue that fight. Whether they hear us or not, we'll continue pounding away on them." "We're going to continue our economic development efforts. "We are working constantly to try to match our workforce up with the jobs that we have coming into the community. Educating not just at the elementary and high level, but also the community college level. We'll continue those in the future to try to make sure that we're getting the best available students coming out of our education system to be able to meet the job demands for the next 10, 15, 20 years. And I'm really confident that with the people that we have in those positions, the school superintendents, the school boards, that we have the right people. We just need the time and the money to be able to get there. "I think if I were to point at one single thing that is going to keep us from realizing our potential over the next 20 years, it is that education component. "I can't speak enough about how important it is. Get involved. The city has got a couple of programs that we work with them. The elementary school district does a summer camp right now for students, we have for fire and police that do summer camp activities with them to expose kids to what real life jobs are all about. "So if you're not involved, (the superintendents of elementary and high school districts) would love to have whatever financial advice, technical assistance, whatever you have to offer, they would love to have that help." "We also were the recipient of some awards this year. I can't say enough about the efforts our staff puts in to some of these projects. "We received the Master Plan of the Year in the Arizona Planning Association for our Life on Main master plan. That is the area south of the tracks that the city in the last few years has been buying chunks of land. We approved the master plan for it last year and hopefully in the upcoming 12 or 15 months you'll start seeing some activity to implement that master plan. "We also for the 23rd year in a row got the certificate of achievement for excellence in financial reporting. What that tells the public is that we're very transparent about what we do. We've got great people that run the finances for the city and I think that at the end of the day that's why we're in the financial shape we're in. The council as a whole is very fiscally conservative, but I think our staff has helped us understand that you can't continue to spend more money than you bring in and sustain a community. "We also won for the 17th year in a row the Distinguished Budget Award. "Also, it is not very well publicized and it's too bad because we also won a Digital Interactive Website Award of Excellence from the City-County Communication and Marketing Association. "We're one of three national winners. "If you've never had occasion to get on our website -- and if memory serves me, we get about 21 million hits a year on the website -- a real testament to the web master (Tom Picklesimer at the time of the award) and Agustin Avalos, our PIO, and their ability to have a website that's interactive, easy to use and is constantly changing." "Again, it didn't get a lot of press coverage, I guess, for that award but I think it really typifies how far we've come in the last five or six years where we really didn't have much of a website and now here we are getting a national award for it." Scroll deep down under NEWS for CG News story about the award, posted Sept. 12, 2014.